Anne Githuku-Shongwe is founder and Chief Executive Officer of Afroes Transformational Games - a company that builds mobile game-based learning platforms out of South Africa and Kenya. Anne's vision is to revolutionise learning in Africa with a focus on delivering positive Africa-focused mobile phone entertainment to the youth market across the continent. 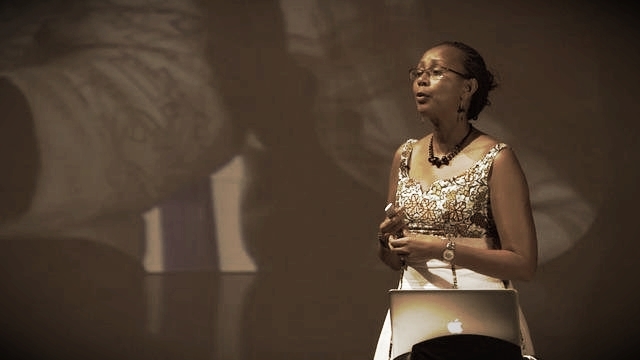 Anne is an acclaimed public speaker on topics related to Social Innovation for the Public Good and Edu-tech and her past speaking engagements include TEDx Soweto; PICNIC, Amsterdam; Netexplo, Paris; Frontiers in Development, Washington DC; Games for Change, New York; Mobile Web Africa and East Africa; Africom and many more. Anne has also been recognised as one of the 15 Social Entrepreneurs of the Year, 2013 by Schwab Foundation/World Economic Forum; and was a Cartier Women's Initiative 2010 finalist. Back in 2008, Anne Githuku-Shongwe had one of those epiphanies in life that saw her end an illustrious 13-year career with the United Nations Development Programme to start an interactive digital media company. At the time, many of her colleagues thought she’d lost her mind. One of them even made a bet with her to the sum of $1 000 that she would be back at her UN desk within six months. Needless to say, that colleague lost the bet. Her motivation to succeed with her new venture was far more powerful, as her vision was to startup a company that could deliver positive Africa-focused mobile phone entertainment to young people across the continent. Anne’s company, Afroes (the name comes from a play on the words African Heroes and Heroines), was inspired by conversations with her own children. She worried that they weren’t being exposed to any positive African media content and that their ideas and aspirations for Africa were being influenced by the Western media’s pervasively negative messages about the continent. She wanted to do something to change that. But it was whilst she observed her son excitedly started relating things he’d learned while playing the computer game, Civilisations, that she realised children who play computer games are a captive audience for anything you want to teach them. She knew from that point onwards that she needed to harness the power of computer games to deliver positive messages to African children. What sparked the idea for Afroes? Afroes’ mission is --- "to inspire the conversations and actions of youth across Africa with a message of possibility and pride". “If Afroes was to be successful it would have to use mobile phones, the true medium of the masses, to deliver its games,” -- the market was certainly there -- Africa has the highest mobile growth rate in the world, with South Africa alone counting 6,3 million users aged between 10 and 24." Anne Githuku-Shongwe has been named among five social entrepreneurs as African Social Entrepreneur of the Year at the 2013 World Economic Forum on Africa, taking place in Cape Town, South Africa. The awards were conferred by Hilde Schwab, Chairperson and Co-Founder of the Schwab Foundation for Social Entrepreneurship, in the presence of President Jacob G. Zuma, Donald Kaberuka, Nkosazana Clarice Dlamini-Zuma, David A. Lipton, and Naveen Jindal. Anne Githuku-Shongwe was one of two leading ladies who were recognized last week for using supreme social innovation to connect youth with technology. "You need to make a combination of on the one hand creating locally relevant content that delivers a message, but also make it fun and attractive. If you make a game that’s boring, you’re dead in the water. We also co-designed the games with the youth users themselves through community based Design Labs to ensure that the games are relevant for the local market." Women empowerment in Africa has still got a long way to go and the economic emancipation of women is a continuous effort. CNBC Africa speaks about gender empowerment to Essential Medicines analyst, Olajumoke Adekeye, fellow leading woman and CEO of Afroes Holdings, Anne Githuku-Shongwe and Ndidi Nwuneli, founder of Leap Africa. Anne Githuku-Shongwe uses the power of digital games to unlock the potential of young Africans throughout the continent. A mother of three children, she argues passionately and eloquently that it is through play and simulation that we can shift their most limiting belief systems and mental models. Anne Githuku-Shongwe discusses the topic on 'Leadership' with the African Leadership Academy. - Anne Githuku-Shongwe is the newly-appointed Representative for UN Women's South Africa Multi-Country Office (SAMCO), which is responsible for women's empowerment and gender equality in Botswana, Lesotho, Swaziland and Namibia, as well as South Africa, where the office is based. Anne is an award-winning social entrepreneur and founder of youth-development digital innovation organization Afroes Transformational Games. She has a Masters’ degree in International Development from The American University; a postgraduate certificate in Social Innovation from the University of Cape Town, Graduate School of Business, and a certificate in The Art of Large Scale Systems Change for Social Entrepreneurship from Harvard University. Anne also brings to her role 20 years of experience as a senior international development professional with the United Nations Development Programme, during which she pioneered innovative and successful approaches to combating HIV and AIDS, as well as Public Sector Capacity Development. "The mobile market will continue to grow in Africa. We are already the second largest market after Asia. The use of mobiles games could help people to move from a place of apathy to a place of hope. My belief is that there is a huge potential that these games can and are already helping young people to learn critical skills and knowledge."